All eyes are on Saudi Arabia as King Fahd's health continues to fail and the succession to the throne of Crown Prince Abdullah draws nearer. Since suffering a stroke in 1995, Fahd has gradually receded from public view--he is now confined to a wheelchair and has been described as "almost comatose" by visitors who have seen him. In July, the ailing Monarch traveled to his mansion in the Spanish resort of Marbella and remained there for nearly two months. Although the king was ostensibly on "holiday," the main purpose of the extended hiatus was reportedly to undergo medical treatment. So precarious is Fahd's medical condition that he did not return home to attend the funeral of his eldest son, Faisal, who died in August after suffering a heart attack. Speculation is rampant that Fahd, like Jordan's King Hussein earlier this year, has returned to die in his native land and make arrangements for a smooth transfer of power. The King of Saudi Arabia is traditionally chosen from among the descendants of Abdul Aziz al-Saud, who founded the kingdom in 1932, by senior members of the Saudi royal family and approved by the Council of Ulamas (Sunni Islamic religious leaders). Thus far, the throne has been occupied exclusively by sons of Abdul Aziz. Seniority has generally been the principal correlate of influence within the royal family and the primary mechanism in determining the pattern of succession, though in the past a number of siblings in the line for succession have voluntarily declined the throne or been passed over by the consensus of the royal family. 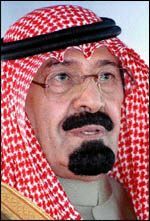 A second factor governing the influence of Saudi princes is maternal lineage--Abdul Aziz had several wives. Sons of Abdul Aziz who are full brothers have tended to form cohesive political alliances against other sibling factions. The most influential and faction is the so-called "Sudairi Seven," sons of Abdul Aziz's wife Hussa al-Sudairi, and is headed by King Fahd. Fahd's six full brothers include Sultan, the Saudi Defense Minister; Nayef, the Interior Minister; and Salman, the governor of Riyadh. The Sudairi Seven are also the most pro-Western faction, strongly supporting Saudi Arabia's alliance with the United States. Abdullah, however, is not a member of the Sudairi seven. Prior to the 1990-91 Gulf Crisis, Abdullah is said to have criticized the kingdom's dependence on American military protection. Believing that Saudi Arabia's long-term security is best served through warm relations with the larger community of Arab and Islamic states, Abdullah has taken the lead in bolstering Saudi relations with Iran and Syria. Discernible shifts in foreign policy have already begun to evolve over the last three years as Abdullah has assumed more and more de facto ruling power amid Fahd's physical and political eclipse--Saudi Arabia's rapprochement with Iran is the most notable example of this. The most important question is not whether Abdullah will succeed Fahd--this is widely expected by most experts--but who will succeed Abdullah. Under the terms of a 1994 law, Abdullah can designate his successor irrespective of seniority. It is possible, therefore, that he will attempt to bypass Sultan, the next-eldest son of Abdul Aziz and a member of the Sudairi seven, in favor of one of his younger full brothers. An attempt to remove Sultan, who is now the Saudi defense minister, from the line of succession could generate a fierce power struggle in the kingdom. Although Abdullah commands the 57,000 members of the National Guard, the leadership of the 105,000-strong Armed Forces is clearly aligned with Sultan. © 1999 Middle East Intelligence Bulletin. All rights reserved.